Clear and dry weather persisted last week. Rajkot and Ahmedabad the Minimum Temperature was 2 C below normal with Minimum Temperature of 10.6 C & 10.4 C respectively. The Minimum & Maximum Temperature has declined during the last two days and are 1 to 2 C below normal while the Maximum Temperature is near normal to 1 C below normal over most parts of Saurashtra, Kutch & Gujarat. The winds are mainly from Northeast. 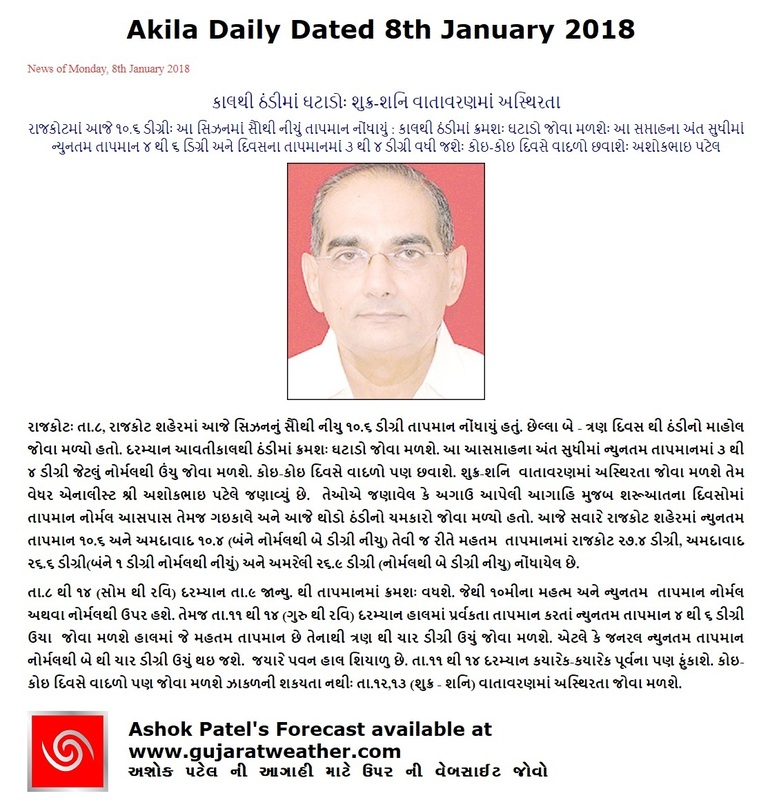 The Minimum Temperature will increase marginally on 9th/10th January and then further increase to have 4 to 6 C rise from that prevailing today the 8th January and will remain high during 11th to 14th January over all parts of Saurashtra, Gujarat & Kutch. The Minimum will be 3 to 5 C above normal during 11th to 14th January. Maximum Temperature will become normal by 10th January and further increase and would be above normal by 2 to 4 C on most days during 11th to 14th January with cloudy conditions on some days. The winds will be from Northeast and from East on some days during the later parts of forecast period. Weather will be dry and no fog expected, however, there is stray chance of instability over limited areas on one of the days on 12th or 13th January. સૌરાષ્ટ્ર, ગુજરાત અને કચ્છ માં ન્યુનતમ તાપમાન 9 અને 10 તારીખ ના નોર્મલ તરફ જશે અને ત્યાર બાદ 11 થી 14 તારીખ ના દિવસો માં ન્યુનતમ તાપમાન હાલ ના તાપમાન કરતા 4 થી 6 સી વધુ રહેશે, જે નોર્મલ થી 3 થી 5 વધુ હશે. મહત્ત્તમ તાપમાન પણ વધવા માં રહેશે જે નોર્મલ થી 2 થી 4 વધુ થઇ જશે 10 થી 14 તારીખ દરમિયાન. હાલ શિયાળુ પવન રહેશે અને ત્યાર બાદ પાછળ દિવસો માં કોઈ કોઈ દિવસે પૂર્વ ના પવન રહેશે. ઝાકર ની શક્યતા નથી. 11થી 14 માં વાદળ ની શક્યતા કોઈ કોઈ દિવસે અને એકાદ દિવસ 12 કે 13 તારીખ માં અમૂક સીમિત વિસ્તાર માં વાતાવરણ માં અસ્થિરતા.